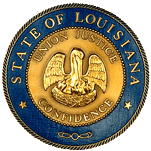 SCR66 CHABERT FISH/FISHING - Memorializes Congress to take action against illegal, unreported, and unregulated fishing in Louisiana's sovereign waters by passing H.R. 774, the Illegal, Unreported, and Unregulated Fishing Enforcement Act of 2015. SCR83 THOMPSON WILD REFUGES/PRESERVES - Requests the Louisiana Wildlife and Fisheries Commission to change the name of the Sicily Island Hills Wildlife Management Area to the J.C. "Sonny" Gilbert Wildlife Management Area. SCR89 ALLAIN CONSERVATION - Establishes a task force to study the performance audit on the regulation of oil and gas wells and management of orphaned wells. HB352 LEGER COASTAL RESOURCES - Relative to approval for land acquisition for integrated coastal protection projects by "acquiring authorities"